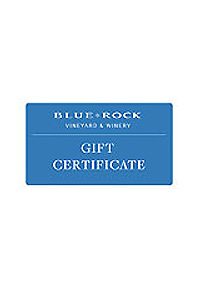 Finding the right gift for someone isn't always easy, but a gift of Blue Rock wine will delight the wine-lover in your life. The recipient of your e-Gift Certificate will receive an email with the code & link required to activate their e-Gift Certificate. Gift Certificates stay in the recipients account until the complete amount is used. Any balance left over after a purchase will stay in their account for future use. Gift Certificates may be purchased for any amount. Each Gift Certificate can be sent with a personal message.